Central Water Commission is monitoring live storage status of 91 reservoirs of the country on weekly basis and is issuing weekly bulletin on every Thursday. The reservoir bulletin shows the information of live storage - All India, State wise and Reservoir wise. The current live storage is also compared with last year live storage position and also with the normal storage (last 10 years average storage). 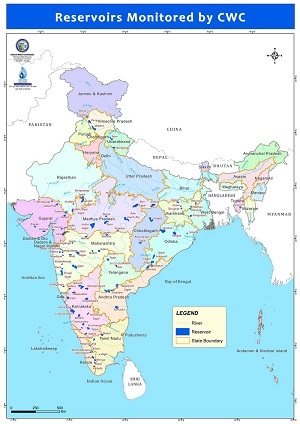 91 reservoirs are divided in five regions namely Northern Region, Eastern Region, Western Region, Central Region and Southern Region on the basis of their state. The northern region includes States of Himachal Pradesh, Punjab and Rajasthan. The Eastern region includes States of Jharkhand, Odisha, West Bengal and Tripura. The Western region includes States of Gujarat and Maharashtra. The Central region includes States of Uttar Pradesh, Uttarakhand, Madhya Pradesh and Chhattisgarh. The Southern region includes States of Andhra Pradesh, Telangana, AP&TG (2combined projects in both states) Karnataka, Kerala and Tamil Nadu.